Studio Meng Strazzara was selected to design the renovation of Ridgeway Gamma Residence Hall, a 232-bed dorm on the Western Washington University campus in 2015. Original scope included building envelope repairs, bathroom finish upgrades, fixture replacements, and furniture upgrades. In addition, our team was asked to assess the conditions of the mechanical and electrical systems, and make recommendations as to their future disposition, adequacy, and useful life. Through the course of assessing the existing conditions and reviewing the original 1960’s design, and with respect to the original scope of work and WWU’s vision for their student housing, our design team proposed a creative solution that not only upgraded the aging facilities, extending the buildings’ useful life, but through careful reconfiguration, increased the quality of the student housing units. 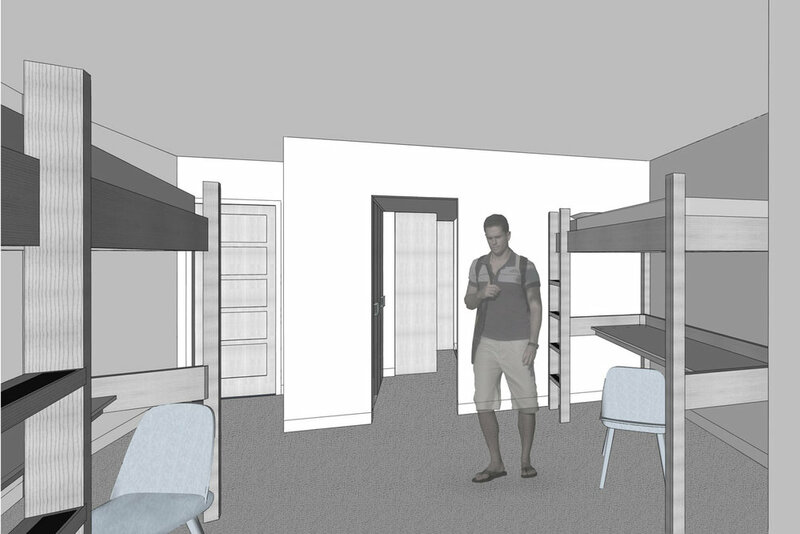 As the mechanical and electrical upgrades would require selective demolition to access the replacement work, our team devised specific reconstruction of walls, plumbing access, and floor layout, to double the toilet and shower facilities in the quad units, and increase the usable unit storage. These modifications and alternative approach to achieving WWU’s objectives were enthusiastically supported and incorporated into the final design.